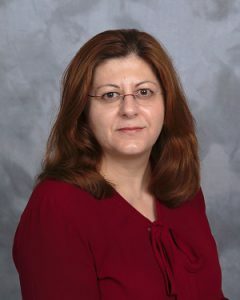 St. Peter’s Health Partners Medical Associates is pleased to welcome Elena N. Theodosiou, M.D., to St. Peter’s Medical Oncology/ Hematology at St. Peter’s Hospital Cancer Care Center in Albany. Board-certified in oncology, hematology and internal medicine, Dr. Theodosiou will practice medical oncology and hematology. Dr. Theodosiou has 10 years of experience in caring for oncology patients. She received her medical degree from University of Athens School of Medicine, in Athens, Greece. She completed a residency in internal medicine at St. John’s Episcopal Hospital in Queens, New York. She completed a fellowship in Hematology/Oncology at The University of Illinois, in Chicago. Prior to joining St. Peter’s Cancer Care Center, Dr. Theodosiou practiced with the Appledore Hematology and Oncology Group at Portsmouth General Hospital in Portsmouth, New Hampshire. Her professional interests include gastrointestinal malignancies, lymphomas, and multiple myelomas. St. Peter’s Medical Oncology/ Hematology is accepting new patients at 317 South Manning Blvd., Suite 220, in Albany. To schedule an appointment or for more information, please call 518-525-6418.